Carl Matt even his name mocks him. The people of Wattle Beach do their best to grind him under foot. Why are the Matts such pariahs? The answer lies in Wiseman's Cove, a short ride across the strait where Carl finds refuge in the most unlikely place. Wiseman's Cove has been waiting for Carl waiting a long time. A Bridge to Wiseman's Cove is one of the most searched-for books on Young Adult Books Central and generates some very emotional reviews. So I had to read it. Author James Moloney was kind enough to send me a review copy and I'm glad he did. To all the kids out there that have written reviews proclaiming that you hate this book, I can only suppose that you're the type of kid that would hate just about any book that you're made to read for school. And I do understand that. I absolutely loved Jane Eyre until this one professor in college ruined it for me. So I say to you...try reading this one again later, with an open mind. You just might like it. Told from the point of view of Carl Matt (and a mat is just what he's been all his life), the story opens with the disappearance of their mother. That leaves Carl and his younger brother Harley in the care of their sister Sarah. When it's way past time for his mother to have returned from one of her "holidays," Sarah decides to hightail it to Europe and leave her brothers with their Aunt Beryl in Wattle Beach. Sarah is only 19, but this marks the second time in the book that Carl is abandoned. Wattle Beach isn't much of an improvement in their situation. Aunt Beryl is proof of that old saw about not being able to choose your family. She even pushes Carl to quit school to help pay for his and Harley's upkeep. Carl does find work with the Duncan's, even though his family's history in Wattle Beach works against him. In fact, he finds a sense of family with them that he's never had before. Much is made of Carl's size and his inability to connect with others because of his fear of being rejected and abandoned. And considering all the things that have happened to him and Harley, it's a small wonder. By the end of the book, Carl finds the courage to grasp some happiness for himself and for Harley as well. I've left a lot out of this review - Carl's blossoming romance with Justine, Carl standing up to the local popular/bad guy, Harley turning from a troubled youngster to a kid who likes to bake cakes, Skip & Joy Duncan letting go of the past...there's lots going on. This is a quiet story full of the little things that make us human and you'll feel more human for having read it. Recommended for ages 12 and up, especially if you're not reading it for school. My name is Zoe Koster, and I am a 15 year old reader of 'A Bridge to Wiseman's Cove' by James Moloney. I absolutely love this book. I'm doing an assignment on it at school. I truly admire the sense of writing James Moloney does. I love the way he makes me feel as if I am in the story when I read it. I also admire the way he throws words together, and makes similies with them. His writing is amazing. One day, I'd love to meet him. That's a real writer! It was alright, pretty boring though. 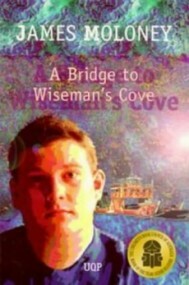 A Bridge to Wisemans Cove is a very emotional book. It is about a boy named Carl, whose mother and sister has left him and leaves his little brother in his hands to look and care for. Carl was very depressed and extremely shy after his mother left and because he was shy of his fat. He then went to live with his aunt Beryl who was very mean and uncaring. He met a lady named Joy who found him a fulltime job at the barge in Wisemans cove. She was the mother of Maddie, the girl that he likes, and she is best friends with Justine. During the novel Joy takes care of Carl and Harley and soon allows Carl and Harley to live with them. Carl soon changes, and becomes more confident and less shy about his fat. He also begins to open up and show his true feelings of his grief about his mother, he shows his grief to Justine and Joy and learns to reconcile his relationship with his mother. A bridge to Wisemans cove is an alright book, but drags on for a long time. There are too many chapters in the book, which are really short. I probably wouldnt have read it, if we hadnt read it at school for English. The book gives an understanding on how some teenagers deal with family problems and how they cope. The book starts of with Carls mother leaving him, causing Carl and Harley to be sent off to Wattle beach to live with Beryl. Throughout the novel, Carl develops and understanding and realises that he can longer hide himself from the world. The book ends, with Carl and Harley finding a family who care about them. I would recommend the book for teenagers from 13-15 as they can relate to themes and topics in this book. This book was very interesting and had a very happy, sad and amusing storyline. I think the book was well written and since it was written in third person so I understood what all the characters very well. I liked the themes of love and family which was shown by the kids being abandoned by their mother and being taken in by Joy Duncan. I think this is what made his book interesting. In the book the main theme I believed was family. There were many family issues in the book with the tension between Harley, Carl and Aunt Beryl. Aunt Beryl does not welcome them as family. She is only interested in letting the boys stay so that she can obtain their social security payments. In the book Carl had issues with his body image and self-esteem. Carl was too self-conscious about his appearance He wore a t-shirt as a paltry ruse against public humiliation. (p44) This is common in most adolescence teens whom I would recommend this I book to. Overall this book is very interesting and in some parts amusing and is a pretty good book to read if you are in year 9 and you would probably like it too. Some parts are boring. I rate this book 3 out of 5.
were do i begin to all you lovers out there this book to me was a piece of my grammas home made apple pie ill tell you why I dont like his book for a couple main reason I dont like the substituting of the osprey to me seems like an idea the author came up with half way through a joint. To me the part at the start were matt is watching maddie seems a little perverted to little kids out there creeping on girls watching them change is a sick mind. To James Maloney out there you should try and include love in this novel with matt and maddie would please all those sick minded kids youve created. Im not just going to talk about how bad the book was I will give it credit for the front cover but besides that I did not enjoy this book at all.